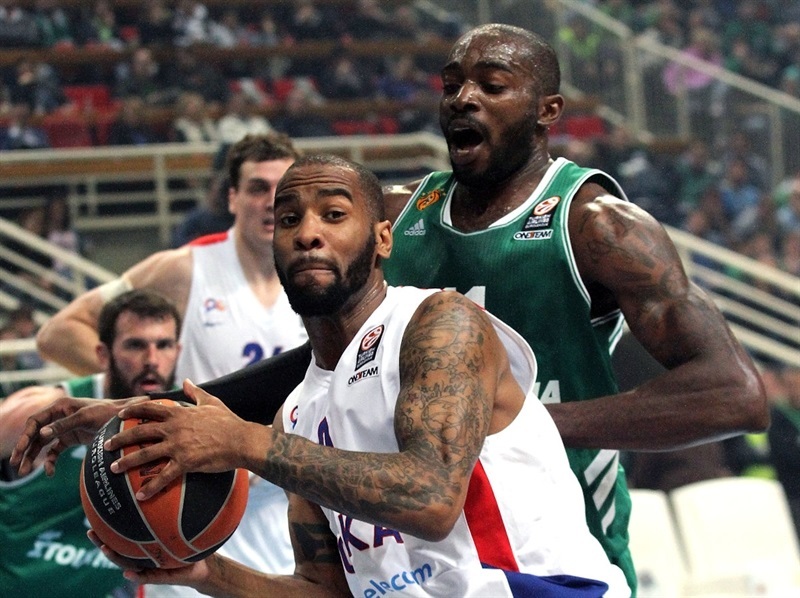 Panathinaikos Athens stayed alive in the 2013-14 Turkish Airlines Euroleague by edging CSKA Moscow 65-59 in Game 3 of their best-of-five series in the Greek capital on Monday. 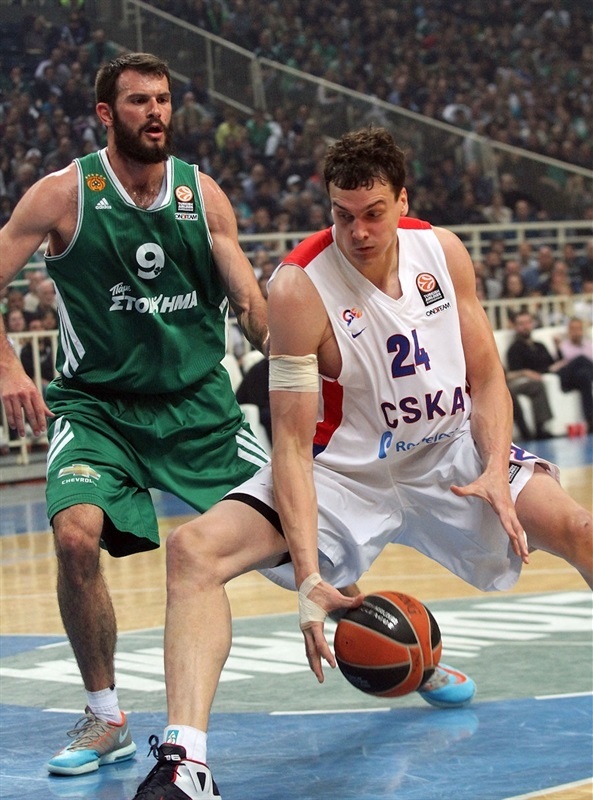 CSKA still leads the series 2-1 but Panathinaikos hosts Game 4 on Wednesday. Panathinaikos legend Dimitris Diamantidis reached another milestone by breaking the Euroleague's career assists record with 978. The previous record belonged to Theo Papaloukas, who dished 977 assists throughout his career. 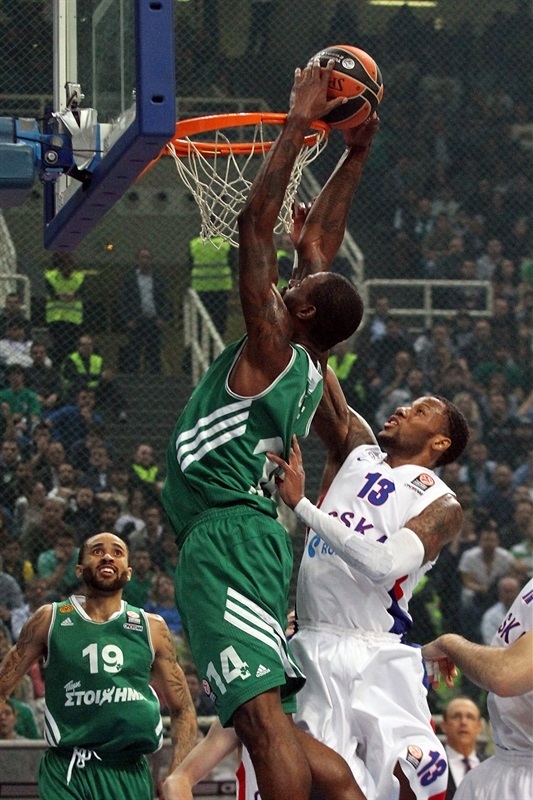 Stephane Lasme led Panathinaikos with 13 points. 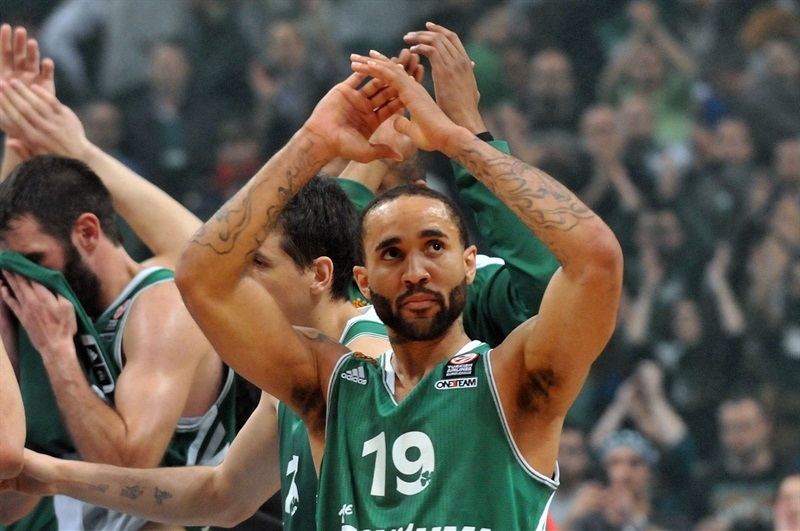 Zack Wright added 10 while Diamantidis had 9 and 5 assists for Panathinaikos. Sonny Weems paced CSKA with 14 points. Vitaly Fridzon added 10 for the guests, who were outrebounded by 35-26. 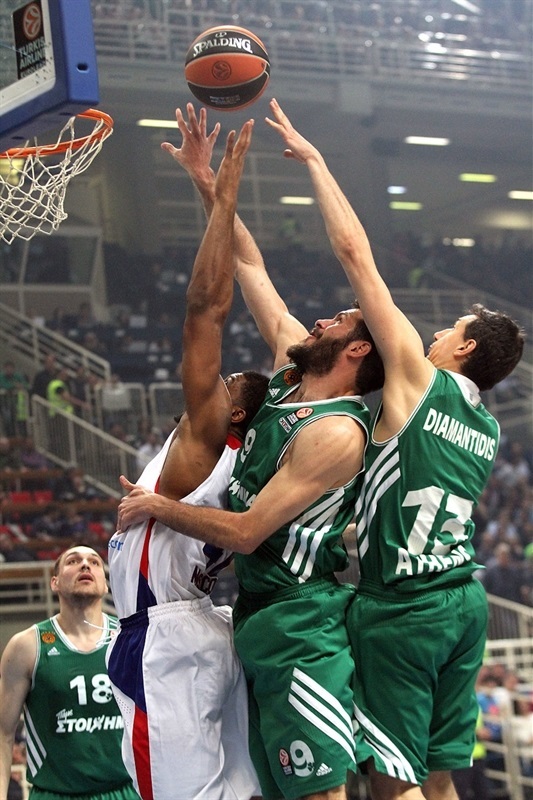 Panathinaikos had a strong start as a three-pointer by Diamantidis gave the hosts an 11-3 lead. Panathinaikos boosted the margin to 20-11 after 10 minutes and then again to 25-13 early in the second quarter. Vitaly Fridzon and Jeremy Pargo fueled CSKA's comeback, bringing the guests within 35-33. Stephane Lasme and Zack Wright restored a 41-35 Panathinaikos lead at halftime. Three-pointers by Roko Ukic and Antonis Fotsis gave the hosts a 49-42 margin late in the third quarter but Weems and Nenad Krstic allowed CSKA to lead 58-59 with 3 minutes left to play. Panathinaikos stepped up on defense, holding CSKA scoreless in crunch time while Lasme and Diamantidis allowed Panathinaikos to record a good-as-gold win. Panathinaikos found an early go-to guy in Maciulis, who drew 2 fouls, hit 3 of 4 free throws and struck from downtown to give the Greens an early 6-1 lead. Sonny Weems stepped up with a jumper but a put-back layup by Antonis Fotsis and a three-pointer by Dimitris Diamantidis boosted Panathinaikos's lead to 11-3. Kyle Hines tried to change things with a close basket that Diamantidis answered in kind. So when Fotsis fired in a three-pointer from the right wing, the hosts had a double-digit margin, 16-5. Vladimir Micov hit foul shots for CSKA that Mike Batiste erased with a left-handed slam, good for an 18-7 Panathinaikos margin. Andrey Vorontsevich made free throws, as Panathinaikos tried a new frontline with James Gist and Loukas Mavrokefalidis together on court. Ramel Curry hit a one-handed jumper in the lane but Aaron Jackson fed Sasha Kaun for a layup that kept CSKA within 20-11 after 10 minutes. Wright pumped up the crowd with an off-balance basket - and the free throw that came with it - early in the second quarter. Fridzon responded with free throws and bettered Mike Bramos's slam with a corner three-pointer, getting CSKA within 25-16. 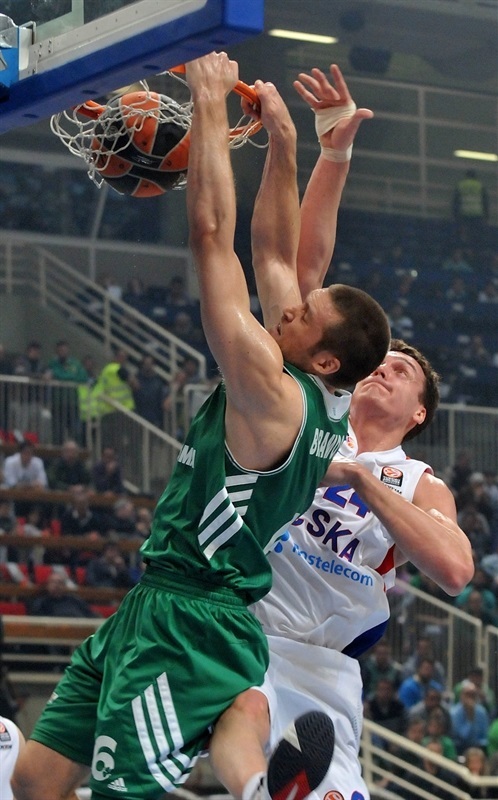 Vorontsevich scored around the basket but Mavrokefalidis improved on that with a dunk-and-free throw combination. Nenad Krstic dunked, Diamantidis made free throws and Fridzon downed a triple off the glass for as CSKA got back to within 30-23. Jeremy Pargo downed an electric driving layup that caused Panathinaikos to call a timeout at 30-25. CSKA kept running its offense through Fridzon, who made free throws before Pargo matched Lasme's layup with a jumper to bring CSKA as close as 33-29. Kyle Hines dropped a baseline shot and Micov a turnaround as CSKA kept the pressure up at 35-33. But Lasme and Fotsis made free throws before a coast-to-coast layup by Wright got Panathinaikos to a more-comfortable 41-35 at halftime. Lasme scored around the basket right after the break, as CSKA struggled to find open shots against the Greens' aggressive defense. 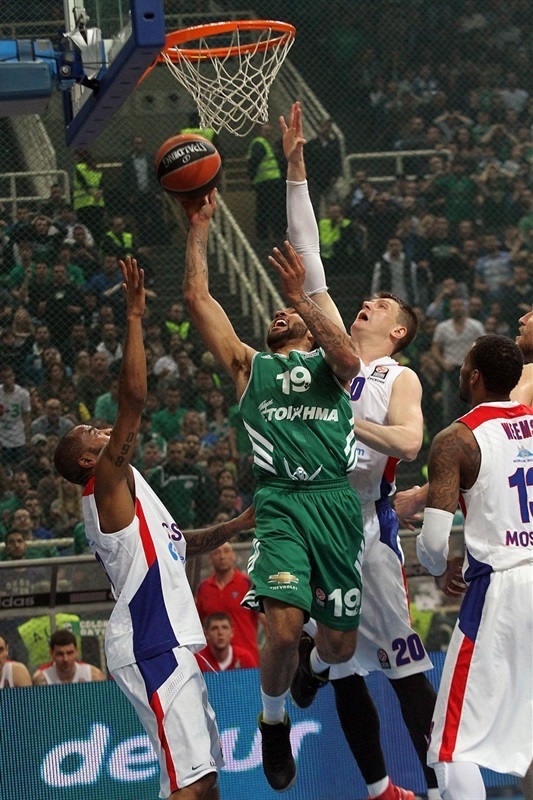 The guests went scoreless for more than 3 minutes but Panathinaikos could not find the way to the basket, either. Weems rescued CSKA with a bomb from downtown and Khryapa fed Krstic for a backdoor slam that made the Greens call timeout at 43-40. Weems kept pacing CSKA with a mid-range jumper to cap a 0-7 run. Ukic revived the crowd with an eight-meter triple that Fotsis followed with his own shot from downtown to give Panathinaikos plenty of fresh air at 49-42. Micov joined the three-point shootout, however, as CSKA stayed all over the passing lines, forcing Panathinaikos to use long possessions and take tough shots. Wright stepped up with a fastbreak layup off a midcourt steal and registered a big block on Jackson as Panathinaikos clung to a 51-47 advantage after 30 minutes. 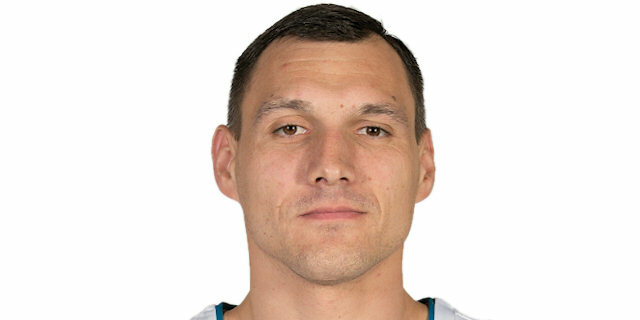 Fourth quarter: Diamantidis breaks assists record! Mavrokefalidis took over with a big basket in the low post early in the fourth quarter. Weems nailed a mid-range jumper and even when Panathinaikos kept powering the offensive glass, the hosts kept struggling to find open shots. Wright split free throws before back-to-back jumpers by Vorontsevich and Weems made it a one-point game, 54-53. Wright kept pacing Panathinaikos with a put-back basket, Vorontsevich split free throws on Maciulis's fifth foul and a wild put-back dunk by James Gist restored a 58-54 Panathinaikos lead. Weems buried 3 of 3 free throws and Krstic a running hook to complete CSKA's comeback with a 58-59 lead and 3 minutes left. Lasme hit foul shots and Fotsis split his for a two-point Panathinaikos lead, 61-59. Krstic picked up a turnover and Diamantidis fed Lasme for a layup which sealed the outcome, 63-59. 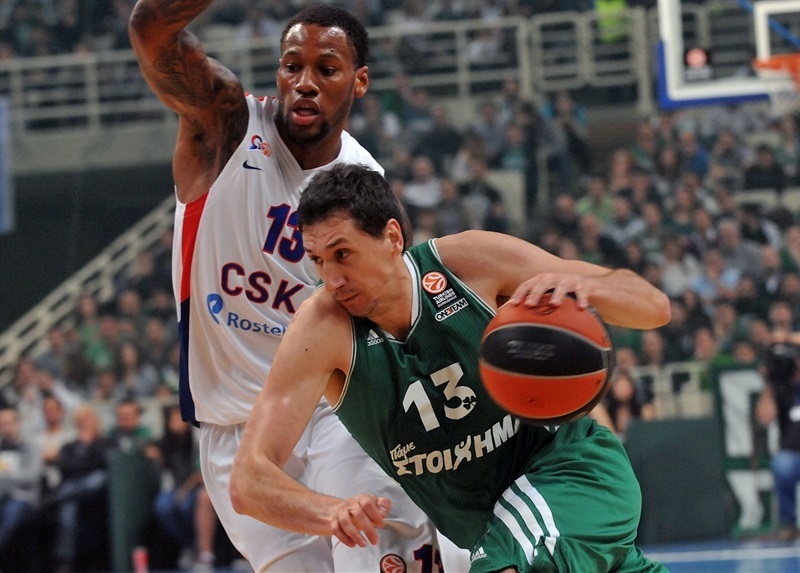 It was Diamantidis's 978th assist to become the Euroleague's all-time leader. 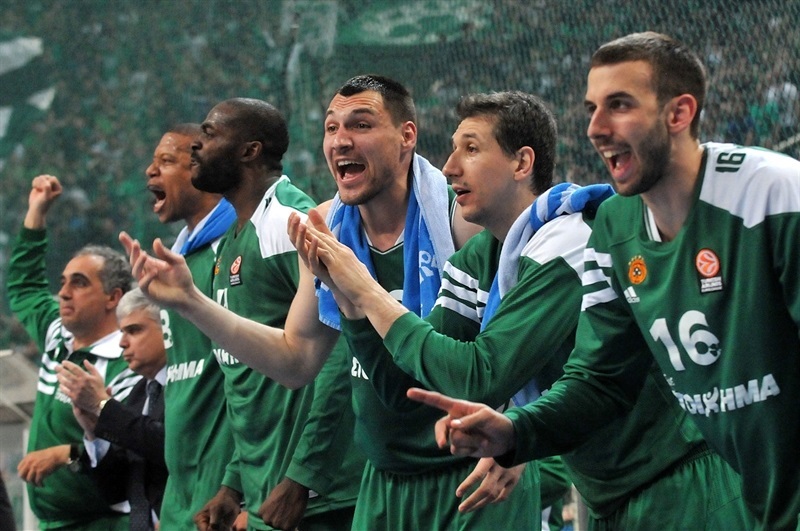 Diamantidis added free throws to round out a perfect night for him and Panathinaikos. “We played too badly in Game 2 and that gave us extra motivation tonight. We were offended by our own performance and knew we should play well in Game 3. Our defense was the key for us, that is what we know better. We must keep it up. Game 4 will be very difficult. CSKA don’t want to back to Moscow and play Game 5. We play at our home court. I think we have a better rotation and we must win. There are no excuses. We have to be in the Final Four."